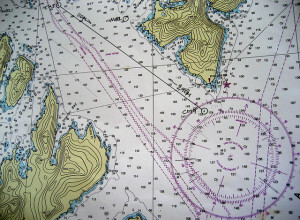 Follow the latest developments on island reclamation activities in maritime Asia. Exclusive new satellite imagery is added on a regular basis. 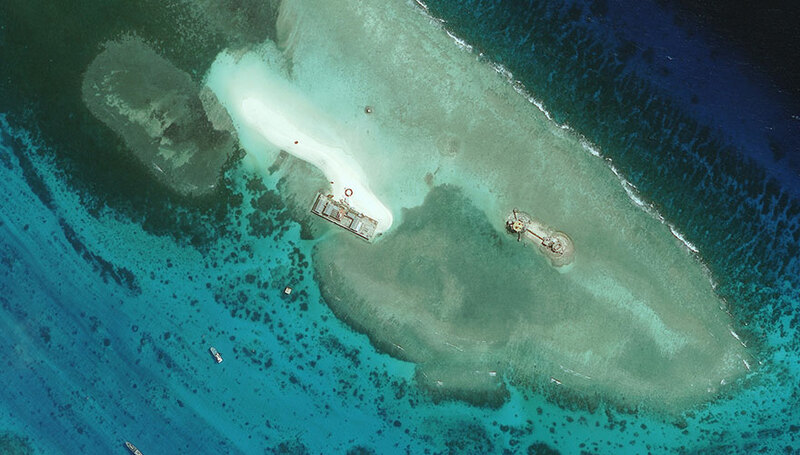 The artificial island at Cuarteron Reef saw most of its construction and dredging during the summer of 2014. Construction of buildings and facilities continues today. 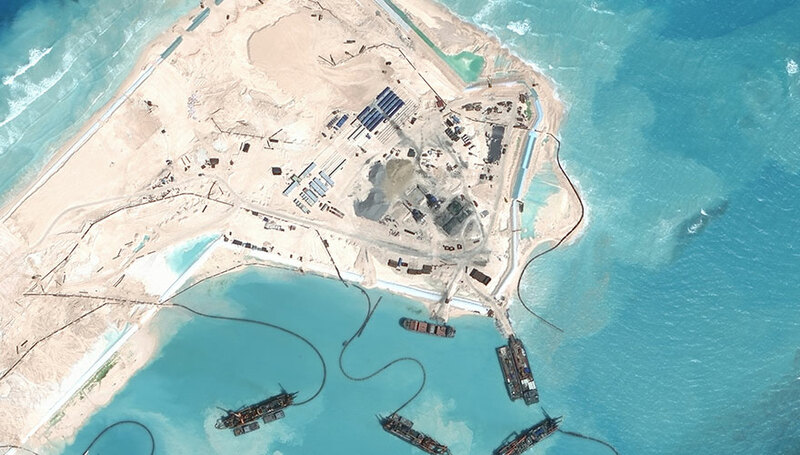 Reclamation on Fiery Cross Reef began in August of 2014. Principal landmass construction was finished by November. Since January of 2015, construction has begun on an airstrip estimated at 3,110 meters in length. Work has also proceeded on a port facility. Construction at Gaven Reef began sometime after March 30, 2014. The island that has been reclaimed since then measures approximately 300 by 250 meters with causeways extending from a central island. Construction on Hughes Reef began in summer 2014. What was once a 380 square meter concrete platform on stilts has been expanded to a 75,000 square meter island through dredging and reclamation activity. Though reclamation began far earlier, significant progress on building construction was made at Johnson South Reef in late 2014. 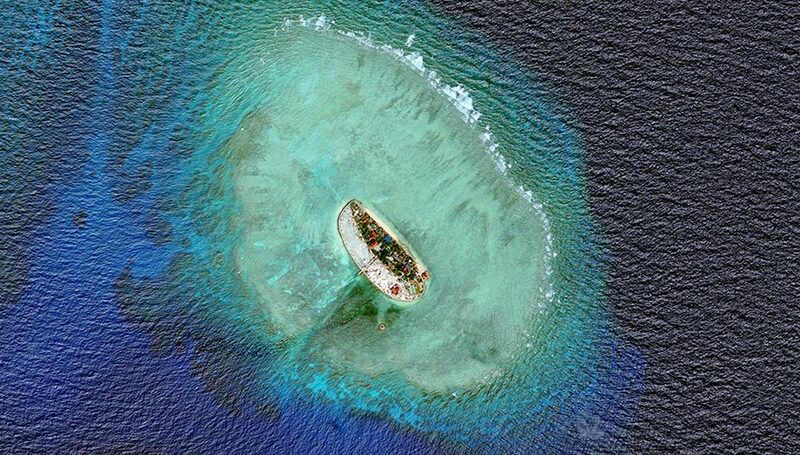 Beginning in early 2015, Mischief Reef has undergone extensive reclamation activity along the western rim of the reef. Recent widening of the southern entrance to the reef, coupled with sightings of PLAN naval vessels around the reef, may suggest a future role for the reclaimed reef as a naval base. 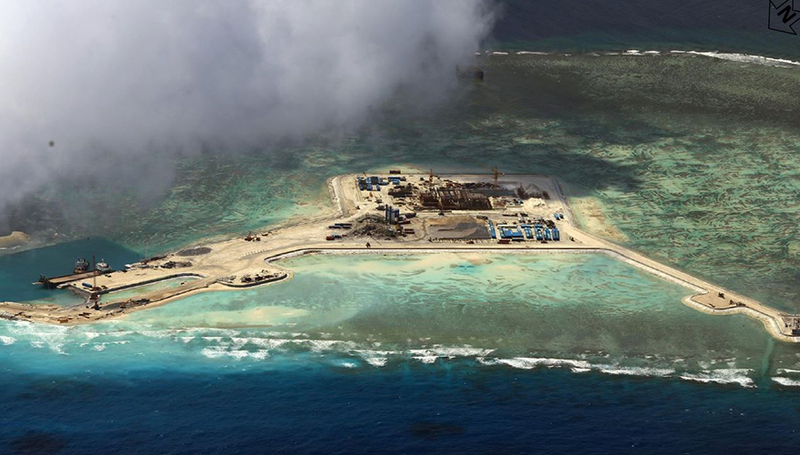 Subi Reef is the most recent feature to undergo significant reclamation efforts by China. 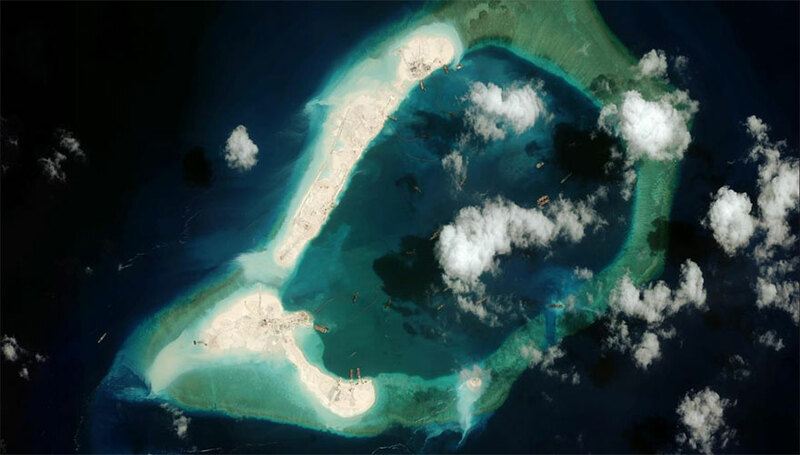 Originally occupied in 1988, since July of 2014 it has seen significant expansion of the landmass with some analysis suggesting it might have the footprint to support a second airstrip, much like Fiery Cross Reef. 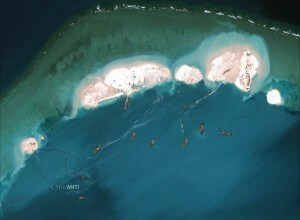 Sand Cay was occupied by Vietnam in 1975 and has undergone sporadic occupation and development ever since. 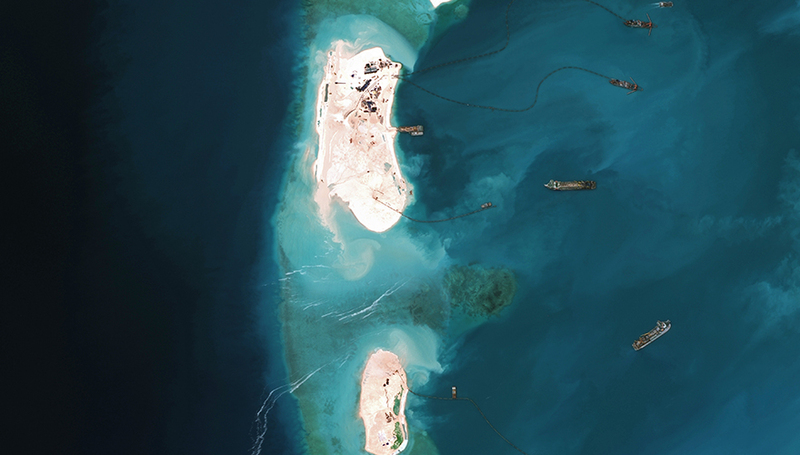 Between 2011 and 2015, Vietnam has expanded the island at Sand Cay by more than 50%, adding extensive defensive structures and facilities and improving existing western facilities. Vietnam is believed to have controlled West Reef without interruption since 1975. Vietnam built a lighthouse on the reef in May or June of 1994 and built various military structures throughout the feature in the years that followed. Beginning in August 2012, the reef has been the site of extensive land reclamation and construction with additional facilities and a harbor being built. All photos unless otherwise credited belong to the Asia Maritime Transparency Initiative and Digital Globe. For related inquiries please contact the Asia Maritime Transparency Initiative. 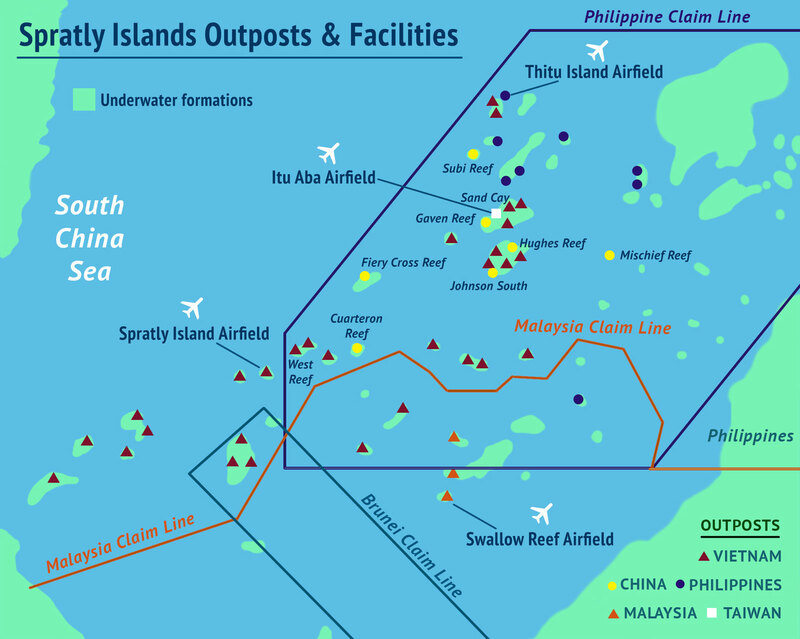 This map shows the major outposts and facilities in the Spratly islands. These islands are known in Chinese as the Nansha Islands, in Malay as the Kepulauan Spratly and in Vietnamese as the Quần đảo Trường Sa. 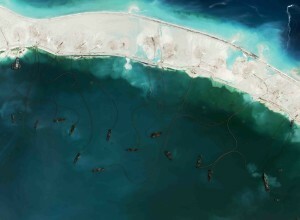 The four operational airfields at Swallow Reef (Malaysia), Itu Aba (Taiwan), Thitu Island (Philippines) and Spratly Island (Vietnam) are indicated. 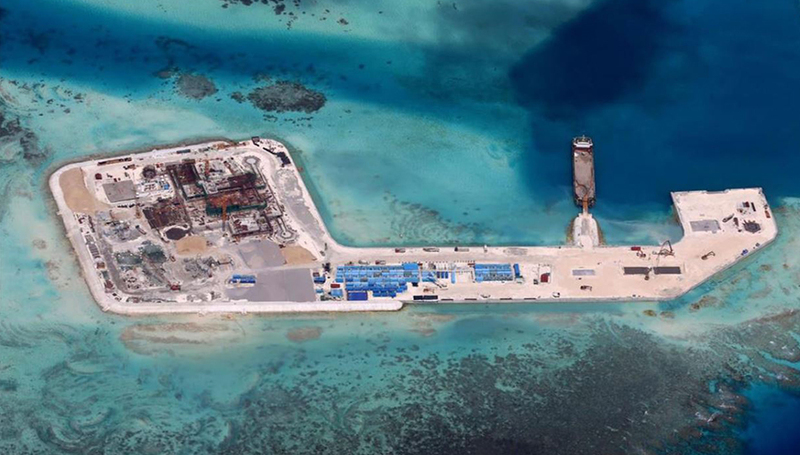 China is in the process of constructing a fifth airstrip on the reclaimed land atop Fiery Cross reef. The yellow dots indicate reefs that China has reclaimed or begun to reclaim: Fiery Cross, Cuarteron, Hughes, Johnson South, Mischief, Gaven and Subi. It is notable that all seven of these reclaimed reefs fall within the claims of the Philippines, with Mischief Reef falling within the Philippines’ Exclusive Economic Zone. Promoting openness and exchange in maritime Asia.